Which new world to inhabit? Worlds Away: download the ebook for free for 24 hours! It’s been a quiet few months on the blogging front, and the writing one for that matter. Work, family and general life (always referred to in that tiredly reverential way) often intervene, another week passes and you’re lucky if you’ve written a paragraph. Of anything. I did actually manage to write a chapter of my sequel to Worlds Away last week, but my old buddy, Self-Doubt, has been chipping away at my progress yet again. Why bother writing in such a huge and uncaring market? Why bother when so many good pieces of work don’t get recognised anyway? It seems good timing, therefore, that I had a little good news today. Just a little bit of good news that might be good enough to get me moving again…A few months ago, I entered my first ever creative writing competition with Writing Magazine, and I found out today that I had been shortlisted as a potential winner. (Worth noting that I didn’t actually win – my excitement would have been off-the-scale had that been the case.) It was also lovely that I only found out this news when one of my talented Y11 students picked up the magazine in the middle of the lesson and pointed out my name. I let her keep the magazine; she’s an aspiring writer and already loads better at it than me. After declaring this on social media, I was instantly inundated with positive messages from my lovely friends and readers. Take that, huge and uncaring market. Since it didn’t win and I can now do what I want with it, please enjoy my short story Silver Lining in its entirety, below. Criticism always welcome. Oh, and if you are one of those lovely supportive people I mentioned earlier, thank you. It means the world. ‘No. Stop. Put it back.’ The curator’s words startle me. I am detected, even in the darkness. I didn’t expect that. These halls have a nasty habit of playing tricks on you; sights and sounds bounce from one hard, grey surface to another, creating a kaleidoscope of the senses. I have been listening to the slamming of my boots on the gritty surface of these halls for only a few minutes, watching shadow and light wage their futile battle on the walls for only a few moments, but the sheer unreality of this place almost consumes me. Yet there are those words again. Am I holding it already? I look down and it appears that I am. It is surprisingly light in my weakened arms. I am glad it was only a curator that found me. At least, that’s what Wren and I call them. With their domed heads and red eyes, they are the most distinctive and also the slowest of the ferrumbots. Surprising that I didn’t hear it approach, actually; the curators tend to trundle on some kind of primitive caterpillar track. Harmless, ugly tanks. There are others: builders and gatherers, mainly. They have been working together for decades now to colonise this place, flattening and burning anything living to become solid metal. What you don’t want to meet on a dark corridor is a shredder. They move quickly. I never had to create that name for them – that name has been used many times. It’s a lovely specimen. Smooth and slightly warm, yet almost brand new. It moves ever so slightly in my arms. A human child. Wren and I have discussed, many times, why they keep some of the humans they capture, and it’s one of the many things we disagree on. She thinks it’s because they have some mysterious plan which necessitates the ownership of several human beings whom they can enslave and use as they see fit. Me? I think the reason is far simpler. I think they are frightened of humans because they have found something that jars with their arid existence. ‘Put it back.’ I have no idea how the words are inside my mind, and even less of an idea why I understand them. I can only guess that their language doesn’t really operate at word level, even though that is what my mind accepts it as. This invasive telepathy started as soon as the ferrumbots arrived on Earth; hospitals were filled with people complaining of mental torment and inner voices. It was only when the complaints became an epidemic that an outside influence was considered. By then, they’d arrived anyway – a melancholy army of silver and black – and there was no further need for questions. The fact that it is ‘speaking’ to me rather than alerting the shredders shows that my stolen sensor works – it believes me to be one of them. I thank God – whoever that might be – that ferrumbots are blind. Despite those angry, red orbs in its head, it doesn’t see. Its sensor picks up mine, and it assumes the rest. I hate to admit that it’s getting easier and easier to hide as time passes; I’m certain that the child starts to squirm and whimper in my arms because I reek of metal. I had felt the need to come here alone. Wren’s health has been failing for a few months now, and resources are becoming harder and harder to come by since the world turned to iron. I remember watching the first wave attack happen. We had never believed that they could get into our houses, such was our naivety back then. The written word was how they did it. Email. Letters. Texts. We opened our doors because we thought they had gone. Wren thinks that they must have at least a little human understanding, because of how they convinced us with our written word. Another thing we don’t agree on: I know that the thing next to me isn’t even close to human. They’d just been watching us for a long time and knew how stupid we were. Why this Earth, though? My gut tells me that we are not lone victims in this onslaught. I have this idea that they are sweeping their way through our entire solar system, turning the landscape of each rock planet into a giant ocean of grey. I cannot fathom why, but I think that is what they are doing. When I close my eyes and imagine their conquest, I see that they have already taken Mercury and Venus, for what is oppressive heat and a lack of water to a heartless automaton? They reached us and we were here, but we were easily defeated. Or so they thought. Because here I stand, holding a human child in my arms right next to one of them and it doesn’t even know what I am. I wonder what Earth looks like from above now. The grey planet. Yet I’m still standing on it holding a child. And they don’t know. My heart swells a little, despite the surrounding shadows. I think the curator is getting confused now and confusion might mean the arrival of the shredders. Why wouldn’t I just put the ‘specimen’ back? I must act quickly, but my eyes are drawn to another human in the cell, hunched at the back, two hungry white eyes meeting mine. It is a man, very thin and grey but still a man, and he has watched the entire charade thus far, unmoving. His eyes move, though, and I know, of course I do, that he does not want me to put the specimen back. I take the sheet of silver metal – the kind they use to smother our land – from my left hand and slowly unroll it to cover the child. Despite my earlier bravado when speaking to Wren, I have no idea if this will work. Unfortunately, I agree with her on this one; I have no idea about the sensitivity of their sensors. The child does not move – a life of having its every need ignored is finally serving it well. The man looks at me with a hint of alarm – or is it admiration? Perhaps I overestimate his capacity to care about his lot. Of course I cannot take him too; there would be no way to get him out undetected. I make a mental note to look for more broken ferrumbots, but it took me four years to find this one and a further two to harness the technology. My hopes for this man are not high, and we both know it. The curator turns and moves away, believing, evidently, that I have put the child back. I grip the thin silver sheet: the child’s only protection from annihilation. On my exit, my boots do not slam. I do not pant. I do not stare wildly at the walls. I walk at a steady pace and try my best not to breathe. Three curators stand at the door and their flickering sensors acknowledge my approach. I pray that the child does not make a sound. These things may be blind but their hearing is perfect. Walking through the central iron fields, I do my best to walk smoothly and calmly, echoing the monsters around me in movement as closely as I can. The child isn’t helping me now. It could be the sudden influx of cold air, smoke, noise or light, or possibly all four, but whatever the cause, it is starting to complain. I walk faster. It may be hidden under a blanket of metal, but it occurs to me that this child will have never seen the blue sky before. Patience, little one, I think. Returning home is the same as ever, except I come bearing a beautiful gift. Wren likes to live as close to the border of the iron fields as possible, so we can see their movements, disregarding the fear that every move we make takes us closer to the ocean. I move aside another stolen metal sheet to reveal our modified doorway – too small for detection and – we hope – too small for a shredder to ever get inside. She looks at me and raises an eyebrow, perfectly plucked despite the ruined skin around it. “I can’t believe you actually did it.” I remove the blanket and show her the child. It – she – is old enough to eat solid food, thankfully – that is all I had time to judge. Looking at her now, I feel a rush of something like victory. Her caramel-coloured skin and thick brown hair look so alive next to the silver walls. Wren is still speaking about how this will “draw attention to us” and how we have “put the child in even more danger now” but I am no longer listening. She forgets how I rescued her once upon a time. Absently, I hear her asking me, yet again, why do it? Why take a child out into the open when the world is doomed anyway? I do not answer, but I have answered her before. The question varies but the answer is the same. Why do anything? Why not just surrender? Why keep living, when the world is turning so unbearably bleak? My answer is always the same. I did it because that is what human beings do. It is, just as importantly, not what the ferrumbots would do. And I am not alone: I find more and more messages from the Underground Movement each day. I have an overwhelming urge to throw open a window. If I open the window at the back of the house, she will be able to see a handful of trees and even the ocean if the day is clear. I will call her Robin. A beautiful bird that can fly from this place somehow. I doubt that Wren and I ever will – the weight of the metal is already on us, but this girl could do it. A splinter of blue pierces the clouds. I absolutely love writing, but, and I know many die-hard “you will write if you’re a writer” types will descend on me with relish for this statement, it is very difficult to find the time. When I wrote Worlds Away, it was an absolute labour of love, aided by a long summer holiday for redrafting and promoting, and I am currently penning a sequel. Am I as inspired as I was with my first book? Do I enjoy writing as much as I did the first time? Yes and yes, without hesitation. What has changed, though, is the amount of actual time I have. Two young boys and a job that is far more than full-time see to that. Added to that, exam marking, being married, and occasionally speaking to human beings outside my immediate circle all take their lovely toll. But the lure of writing calls strongly. More than strongly. I berate myself for putting it so far down the list. So, to writing. For some reason, I’ve found it difficult to be back in the world of my first novel, so I did something I have never done before (don’t ask me why) and I penned a short story. I know that Stephen King forged his early career in writing and submitting short stories for publication, but I don’t read many (compared to how many novels and plays I read, anyway) so I’ve never written one. Maybe I believed myself to be unqualified. However, last night, I found myself entering a new level of challenge. How does one construct a world and believable characters in such a short snapshot? Please believe me that I do not for one moment think that short = easy. There is a wonderful art to the short story that I am just starting to appreciate. The result of around four hours was a half-decent first draft for entry into a writing competition. It’ll need messing with for the next week or two, but that’s the joy of writing for me: creating something and then perfecting it. And it’s all mine. It wouldn’t have existed without me. I’d love to hear from fellow writers. Is this the way to fit writing in my life? Is busy ever too busy to make your mark on the world of writing? I tried to write something that wasn’t sci-fi, but my mind just doesn’t work that way. I’m thinking of creating a collection of sci-fi shorts exploring the big themes that interests me. Will anyone be interested in that? I have no idea. Hope so! Worlds Away: free download for three days! Download your free copy of Worlds Away for a limited time only and treat yourself to modern a star-crossed romance for the weekend. Rated #2 in Science Fiction romance by Amazon. It was an absolute honour to be invited onto BBC Radio Sheffield to discuss my debut novel, Worlds Away. I would like to remind anyone out there, who is considering doing something they think they can’t do, do it. Chances are, you probably can. Listen below! Thank you for all your support so far, readers. You keep me going! Worlds Away: Free 24 hour download for the final time! The title says it all, folks! This is your final chance to download my debut novel, Worlds Away, free of charge before I really get going on the next book. Free downloads will cease at midnight tomorrow. Surprisingly, that’s a tough one to answer. I have made no secret that Worlds Away is the first in a trilogy, a trilogy that I have already planned (on a spreadsheet, no less) and have even, cautiously, penned an ending for. I love the characters, and I want to write it. The problem, though, is that I’ve also had another idea, an idea which is niggling and biting at my subconscious each day, and I therefore feel like I’m cheating on my first love. When writing Worlds Away, there is no question that I partially inhabited that world. I would be jogging, pushing the pram, cooking tea, whatever, and something about Kolwick or Oscar 70 would occur to me and be the most important thing. I’d have to write it down with a genuine degree of urgency, before carrying on with my day. Unfortunately, I’m not a full-time writer, so I feel like I can only commit to one project at once. So what to do? Which world should I inhabit? Will it be the already ongoing project that readers are actually asking for, or my new, exciting, secret love? It seems that it’ll just have to be both of them. The title says it all, really, but I am pretty pleased. The novel is currently ranking #199 overall out of over 6 million books on Amazon, which I think is quite an achievement. Today has also seen a record number of downloads within a 24 hour period. Yes, it’s been a good day in the world of self-publishing! I would encourage any authors who are on the fence to join me. It’s exhilarating. 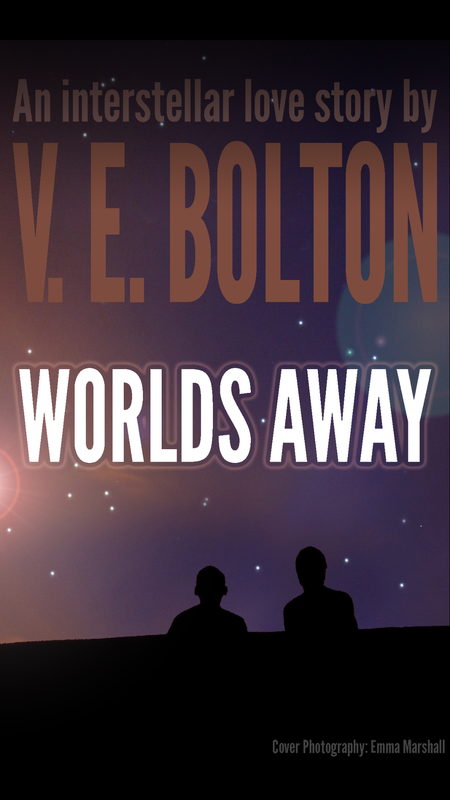 For a limited time only, you can download the new science fiction romance, Worlds Away, by V. E. Bolton, for free, by clicking here. The novel has so far received rave reviews. Why not try it for yourself? Long before I finished Worlds Away, I knew that it was going to be part of a trilogy. The story that lay, hazy and nebulous, in my mind, could not be told in one novel, and not in just two. That said, I like the neatness of a trilogy, and am not planning to go beyond three, for now anyway. Perhaps it is a little like children, and one day I will say ‘one more,’ but for now, a trilogy it is. I’m not sure how conventional this is, but I’ve already written my ending, and am now gearing myself up for the sheer joy of moving from Point A to Point B. Or Point B to Point C, if we are being exact. I can’t wait. I expect I’ll be bereft when it’s over. 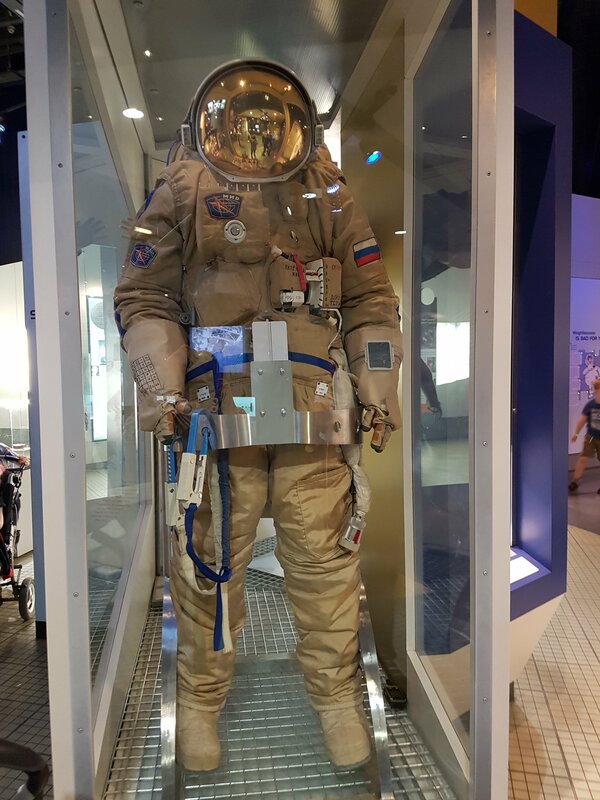 Today, I spent the day with my family in one of my favourite places on Earth: the National Space Centre in Leicester, consuming everything spacey with a hungry pleasure. If it is research, I love research.